Many readers and subscribers of MacAutomationTips are Mac users that are already using Mac automation applications, and that’s super great. But I also want to reach out to Mac users who have not started using Mac automation in their daily workflow. For those of you who are not using applications like Keyboard Maestro, BetterTouchTool, Hazel, TextExpander, Dragon Dictate, PopClip, smart folders, and iClip, this article is a list of recommendations for how to get started with Mac automation, and thus become more productive and save time while working at your Mac. Here’s also a 5 minute video of that quickly explains the applications and features I include in this article. If you want to see more and better videos about Mac automation, check out and subscribe to my YouTube Channel. Note: this article doesn’t explain how to use the applications I reference. Instead, I explain what type of tasks are possible with Mac automation. This article includes links to other articles that explain more about the referenced applications and how they are used. 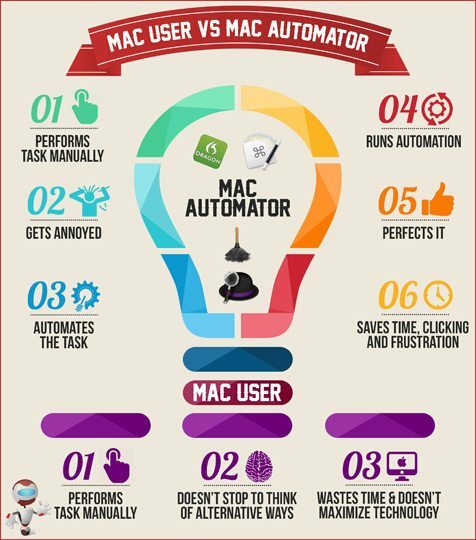 The goal for you is to go from being just a Mac user to a Mac automator. To understand how you could be using Mac automation, start noticing what tasks you repeatedly do on your Mac. Do you open and close the same applications and websites on a regular basis? Are there special words, names, and URLs that you regularly type? 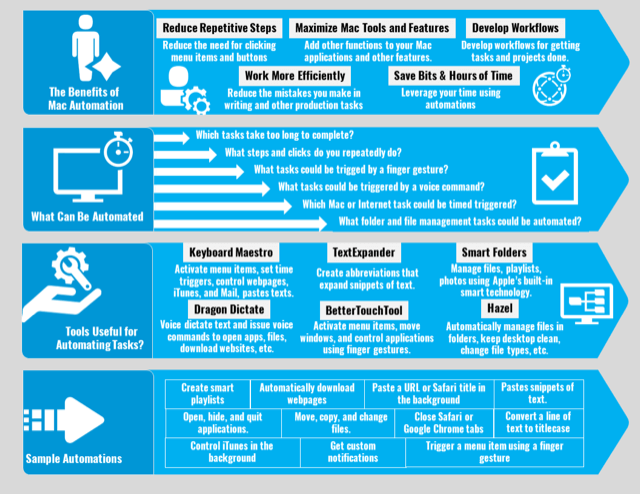 Are there steps you regularly take to complete a task, such writing and sending an email, managing files and folders, or using the cursor to click on menu items? Do you find yourself moving your hand back and forth between your keyboard and mouse or trackpad? Many redundant tasks, both small and large, can be automated to reduce the number of steps you take to get something done. So start noticing which redundant tasks you perform. When you find yourself repeating something more than three times, that task is probably a good candidate for automating. Most of what many of us do on our Mac is type emails, produce documents, and produce other forms of written content. That’s why it’s important that you use applications like TextExpander that can help you automatically type words, phrases, names, URLs, form letters, etc., that you regularly type. To speed up your typing, you can create text abbreviations and snippets to do the typing for you using applications like, TextExpander and TypeIt4Me. You may already be aware of the text expansion feature in macOS and iOS. For example, as you type in applications like Mail, macOS will attempt to auto-complete some words for you. This article explains how to use the auto completion feature found System Preferences on your Mac. When it comes to managing files in Mac, such as keeping your desktop or Downloads folder clutter-free, the classic application Hazel can do a lot of the manual work for you. Hazel allows you to set up rules for acting on files and folders. For example, Hazel can automatically move files on your desktop to a designated junk folder, or specified folders according to the file type, name, date created, etc., that you set in a rule. Hazel should definitely be a program that all Mac power users use. See this article for example of what Hazel can do. Another task that many of us writers and bloggers do on a regular basis is copy and paste text. 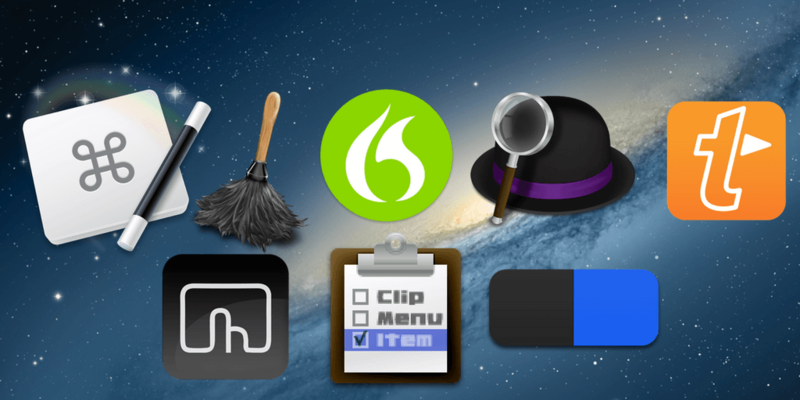 If you’re not already using a clipboard manager, you’re most definitely wasting a lot of precious time retyping text you’ve previously copied before but didn’t save. I suggest you check out applications like iClip (Apple Store link), ClipMenu, Copied (for both Mac and iOS), or Copy’em Paste. These applications can retain over a hundred of your recent clippings, and you can use one of them to paste texts you’ve previously copied. In the video below, I trigger open the mini ClipMenu snippets window, and from there I can select and paste a stored snippet or choose from the list recently copied clippings. There are several other ways to copy and paste text, but choosing one of the programs I reference above can help you get started. Launching applications, files, and downloading URLs are not arduous tasks, but they can become redundant tasks that can be automated or least done more quickly. For launching applications and files that are not in your Dock, you can use applications like Spotlight, Alfred (Mac Store link), SuperTab (see this article that compares SuperTab to macOS Dock), Keyboard Maestro, and BetterTouchTool. For example, you can trigger Alfred, which is similar to Spotlight, to type the name of any application you want to use, and launch it without having to open your Applications folder. macOS includes a feature for performing tasks using finger gestures. For example, you can swipe with your fingers to delete emails or go back and forth between webpages in Safari. But there’s an even better application called BetterTouchTool that allows you to trigger application menu items, and over a hundred other actions using assigned finger gestures. In the video below, I use a Three Finger Swipe Down to trigger ClipMenu. I highly recommend BetterTouchTool as the first advanced Mac automation program for those new to Mac automation. BetterTouchTool may seem difficult to use, but once you learn how to set up actions and assigned gestures, you’ll return to this application for nearly everything you want to do when your hand is on your trackpad or mouse. See my article that compares BetterTouchTool with Apple’s finger gesture feature. There are many tasks, such as opening applications and launching URLs that you may do every week, at a set time. The automation Keyboard Maestro is one of few applications that can trigger designated tasks at a given day(s) and time(s). Keyboard Maestro can do hundreds of other tasks, but I recommend creating timed macros for getting started with the program. For more about Keyboard Maestro, see my tutorial for how to create a time and day trigger on your Mac. I use Dragon Dictate more for voice commands, such as downloading webpages, opening and quitting applications, navigating iTunes, pasting texts, and hundreds of other tasks. Dragon Dictate is certainly buggy at times, and it takes some time to learn, but if you work at your computer throughout the day, it’s well worth the investment for voice commands. Hopefully Apple will eventually create a voice command system that works better than Dragon Dictate. Another useful macOS tool is the text-to-speech feature found in System Preferences that will read back selected text to you, either text you’ve written or text from an article. To use the speech feature, simply select some text, and then choose Speech > Start Speaking from the drop-down menu. You can also use a tool called PopClip which allows for adding a speech widget. Lastly, I recommend using application called PopClip, which presents dozens Mac actions when you choose a one or more words of text. You can use PopClip to quickly copy and paste text, format selected text, convert text to title case, do quick Google searches, and much more. See my article for more about PopClip. 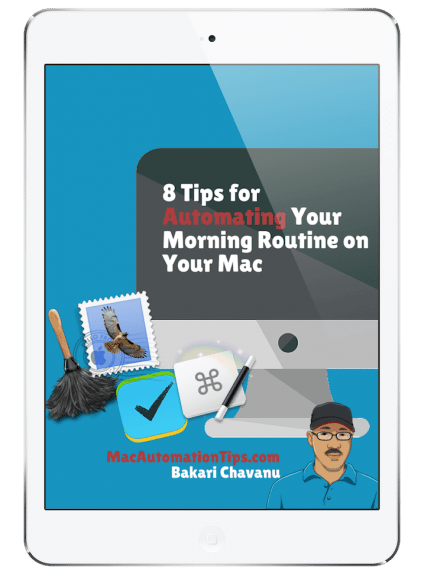 Now that you have gotten an introduction to Mac automation, I invite you to subscribe to MacAutomationTips so that you can learn more about Mac automation tools and strategies. When you subscribe to this site, you will get access to my free Subscribers Only Resources Library that includes over a dozen PDF guides that you can download at your leisure. 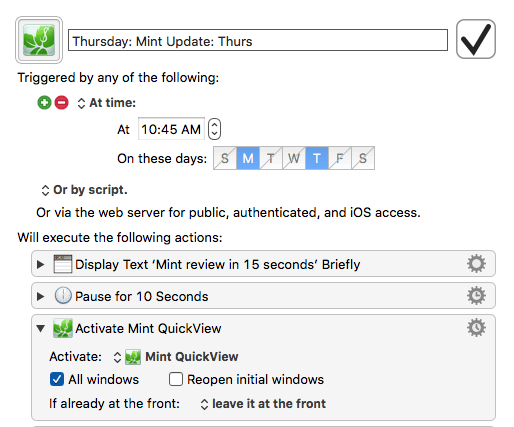 It does take some time and effort to learn how to use the applications I reference in this article, but I guarantee you, you’ll regain that time and a lot more when you start bringing Mac automation tools into your daily workflow. Thanks for recommending these applications. I know automation saves time, its just learning the apps that takes so much time. Hey Brandon, yep it does take time. That’s why you will want to take advantage of this tutoring. I can help you get up and running with an application that you really want to use. Would be helpful if you linked to this from the resource library. It took a lot of hunting to find. Hmmm, the Resource Library is made up of PDF guides. Did you try doing a search for this article and it didn’t come up? Get this download and access to my Subscribers Only Resource Library.